We had a great 1st Saturday Breakfast Club! Thank you Linda Humphreys for your trunk show... you inspired us with your amazing machine embroidery and software talent! We had a packed house... thank you to all who came and enjoyed the morning with us! Next Friday and Saturday is the annual Four Corners Quilt Gathering.... however it is completely sold out. If you do not have tickets to attend, the next best place to be is right here at Cortez Quilt Company and More! This is an all-day open sew day! Work on your UFO's! Avoid spring cleaning at home! We will have door prizes and goodies, but you must be in attendance. Call early as space is limited! Join us on April 18th at 12:30 p.m. for our monthly Third Thursday Demo. This event lasts thirty minutes – feel free to bring your lunch if you are on your break. We always have door prizes at our Third Thursday Demo’s! Bring a friend! April – Aimee used to teach “Back” School at Southwest Memorial Hospital. On April 18, I will be sharing how to figure out the correct height of your sewing desk and cutting tables. You will be amazed at how much better you will feel and how much more you are able to get done when applying these techniques! Blocks Without Borders (an Art & Landscape Society) meets on the Third Thursday of each month at 1 p.m. Prepare to exchange ideas, along with giving and receiving inspiration. Don’t forget to bring your Show-N-Tell! We will have a door prize! No RSVP necessary. 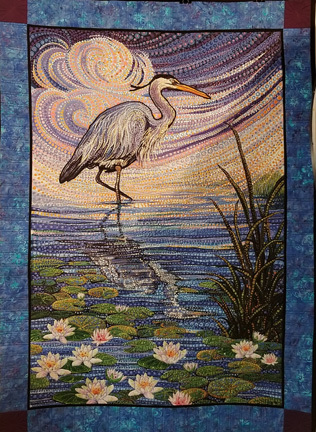 Uncertain that you can create an original art quilt? This next gathering of Blocks Without Borders” (our CQC Art and Landscape group) is just for you! Witness the unveiling of our BIRD CHALLENGE entries. All original designs, all individual representations of whatever the word “BIRD” means to the artist. 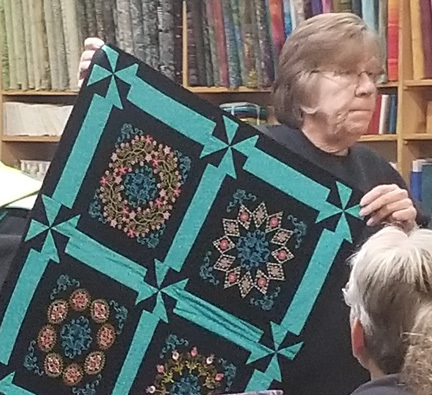 See the creative miracles from a couple of participants who risked their piecing reputations to take a stab at art quilting for the first time! The results are spectacular – a flock of fiber and fabric feathered flights of fancy that will be exhibited at the Cortez Cultural Center during the upcoming Mesa Verde Bird Festival in May. Cast your vote for the Quilters’ Choice award for 1st, 2nd and third place bragging rights. 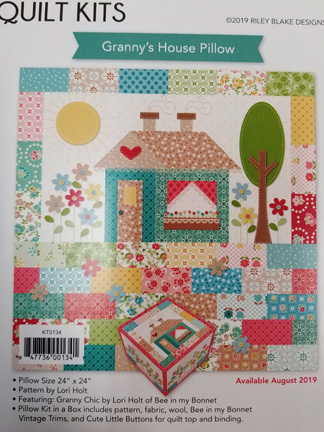 Our April project will be creating a “Post Card” quilt – led by Marie Wirth. Bring scraps, your machine and a post card or picture idea. 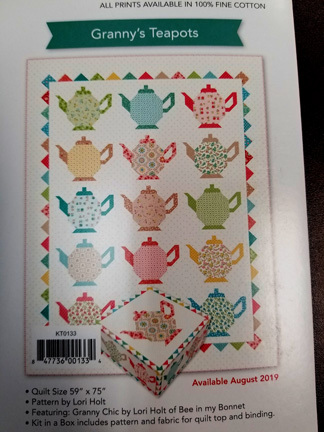 Look for a surprise guest demo and a brainstorming discussion led by Janet Huffman on how we might incorporate Quilting Arts Magazine type monthly challenges to our agenda! Our May gathering will be a thread painting class plus unveiling our next challenge. Come experience how you can be Sew creative! 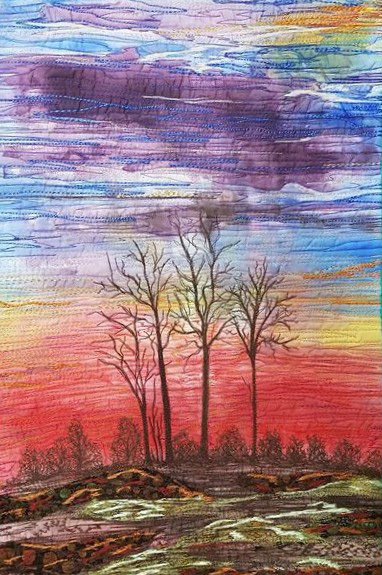 Michelle is a textile artist from Australia. She will be in the United States in August and is a featured guest on the Ricky Tims Show. While in Colorado, Michelle will be coming to Cortez to present two workshops! I would like to introduce myself, my name is Michelle de Groot, I've in rural Victoria near Ballarat on a 70 acre hobby farm. I have a studio to work in which is 14 x 6mt in length and width. Then I progressed to creating with flowers and art and crafts in my younger years by becoming a florist and business owner. I was very busy making wedding arrangements and bouquets for many years. This was a wonderful career but with marriage and a child I decided I needed something to keep me home a little more and less physically demanding. While in town I saw a patchwork shop and walked in amazed at the lovely quilts on display and thought straight away, “I can do this”. And I did. I started like most people with the basics, early on sewing my quilts together by hand piecing and hand quilting. I then progressed to machined sewing as I realized I wasn't going to live long enough to make all the wonderful things I wanted to make. After realizing I had found a new love and addiction, I then wondered how I was going to quilt them, hadn't tried that part of it at that point! So I started taking classes and practiced a lot at home and after 4 years of constant practice I began to quilt my own quilts, saving me a fortune! Once this was achieved, me being the forever wanting a challenge, I decided to try my hand at textile arts. And WOW did I love that! I then set about learning and learning and learning, making sure I didn't miss anything, always striving to be better at what I was doing. Once I found myself at a point where I had found my niche I then decided, after many people asking me to teach them to do what I did, that it was time to start teaching what I had learnt over many years. And here I am today, a textile artist, professional quilter, artist and tutor in my own right. You can read more about Michelle here. Cost $120.00 - Limited Seating - Call Now To Reserve Your Spot! Kit fees are $20 per person. Kits will include the use of all my paints, fabric, wadding and backing to do your project. I created this workshop a few years ago and most people are amazed at how easy it is to create their own piece of art from a white piece of fabric and some paints. The coneflowers are actually painted on making this a whole cloth design. I explain how to use the textile paints and non-textile paints in this process and also show the students how to divide up your background area and create some real interesting designs on their art piece. This workshop is great for those wanting to learn new techniques and skills in textile arts. 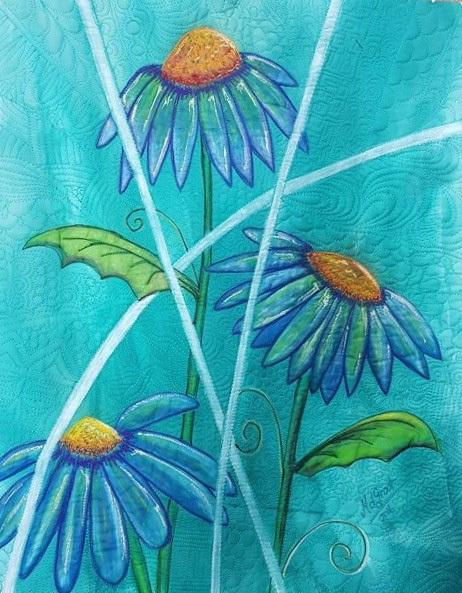 You will learn how to paint onto the fabric to create a nice background as well as the foreground picture of the cone flowers. You will also learn some basic quilting techniques and thread work, and to top it off you get to play with some bobbin work. This workshop has a lot of meaning to me as it is derived from an experience I had on my property 6 years ago. We had a bushfire locally that burnt through our property as well as many others. Luckily we were one of the lucky ones and our home and buildings were saved by the local fire brigade and helicopter water bombing. I noticed after the fire the damage the surrounding bushland had suffered as well as the amazing colors in the sky in the evening. This experience moved me to create this small art quilt, and then in turn teach people about the techniques I used in making it. 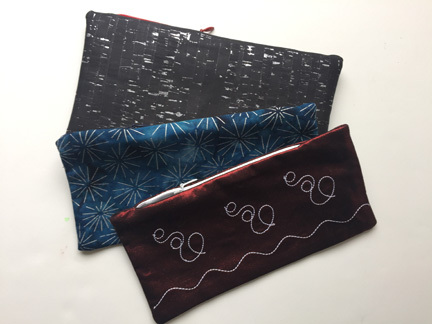 This workshop is great for those wanting to learn new techniques and skills in textile arts. You will learn how to mix their paints and how to apply them to fabric correctly. You will learn how to paint onto the fabric to create a nice background creating a starting point for your thread work. You will also learn some basic quilting techniques, thread work, and bobbin work. 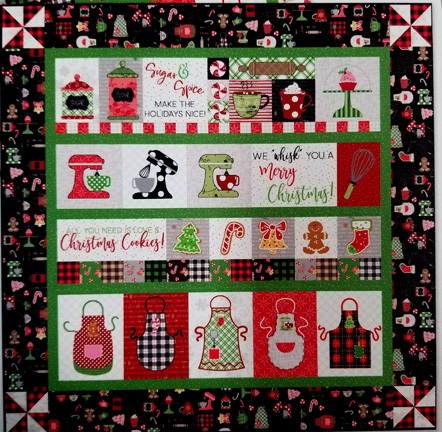 Cortez Quilt Company and More is now taking Pre-Orders on the following kits. Be sure to call and reserve yours now to ensure that we order the proper amounts! Please call us at 970-565-7541 by Tuesday, April 23rd to reserve any of the following kits. Includes pattern, embroidery CD, fabric and embellishments to complete the top. Includes pattern, fabric and embellishments to complete the top. 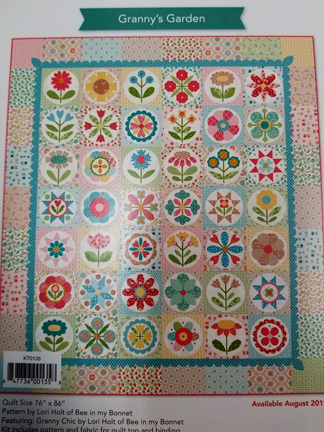 This will be Lori Holt's next Sew Along Quilt this coming August! Includes all fabric for quilt top and binding. Quilt Size 76" X 86"
Kit in a Box includes pattern and fabric for quilt top and binding. Pillow Kit in a Box includes pattern, fabric, wool, vintage trims, and buttons for quilt top and binding. Be sure to come play Block Lotto! We have a great spring floral collection to play with this month! Come by and pick up your packet. Use the 5 fat eights to make two 12 1/2 unfinished blocks. You can only use the fabrics found in your packet. Bring your blocks (labeled with your name) to the shop on or before the last day of the month. For each block you bring in your name will be entered into the drawing to win all of the blocks that month! The winner will be chosen at random at the following month's 1st Saturday Breakfast Club! 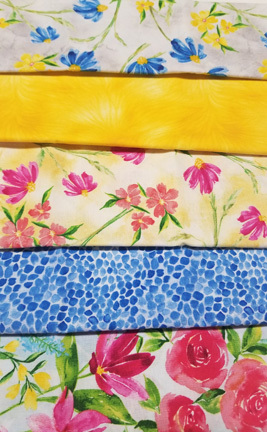 The winner is eligible for 10% off the fabric to finish their quilt. These fast and fun placemats are made with Soft and Stable by Annie and 2.5 inch wide strips of fabric. 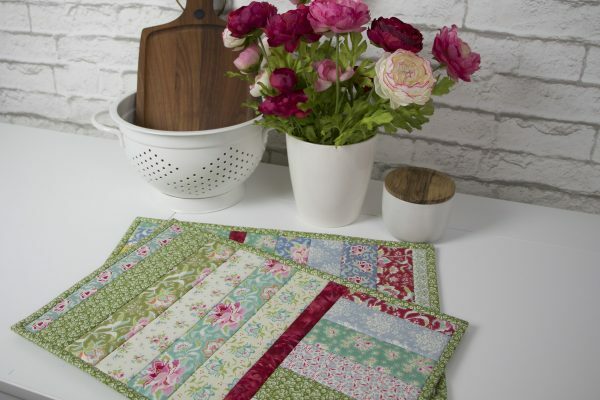 The ever popular flip and sew method will make fast work of these placemats. you will want to make a set for every season or occasion! See description above for more details! 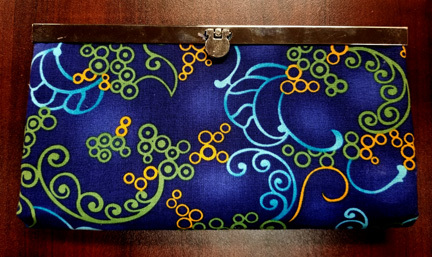 This wallet (and class) are wildly popular. With a fun clutch top, you will find once you make one, you will need to make more for every occasion, and for all your friends! Trapunto, thread painting, couching, free motion quilting… and bling. This project has it all – talk about spectacular! Be sure to sign up early as these classes fill up fast! Todd has a lot of things he would like to share from the technician department, hence this new feature of the Quiltzette! Here is your first installment. When loading your BERNINA machine into, or out of your rollling bag, be careful not to knock your multifunction knobs against the bag. This will result in one of three things happening: 1) you break the knob internally resulting in the need for a new $13 part, plus $30 labor; or 2) you break the circuit board where the knob inserts into it resulting in a $42 part, plus $30 labor; or 3) you break both parts for $55 in parts, but still only $30 labor. 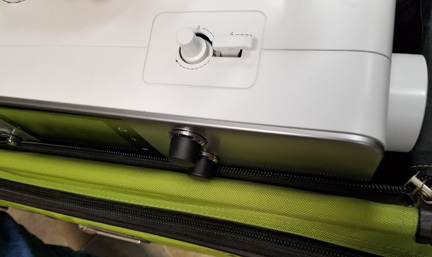 We see more of these issues with the Tutto bags, (which are nice because they have 4 wheels to roll on and various colors) because they have a solid metal frame all the way around which is much less forgiving than the BERNINA cases which have a soft front (and are consequently less expensive). 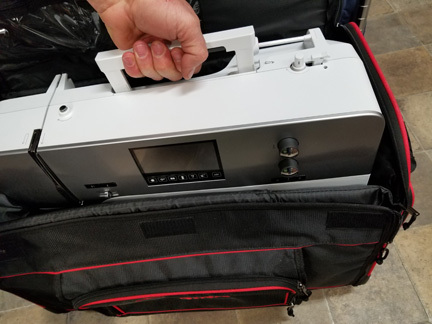 Regardless of which brand of case you prefer, we do see this happen with all of them, so use extra caution when loading and unloading your machine so that you can save that money for fabric or notions! 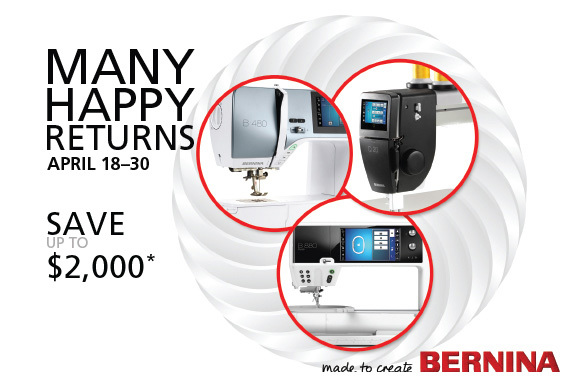 Use your tax refund to purchase the machine of your dreams! 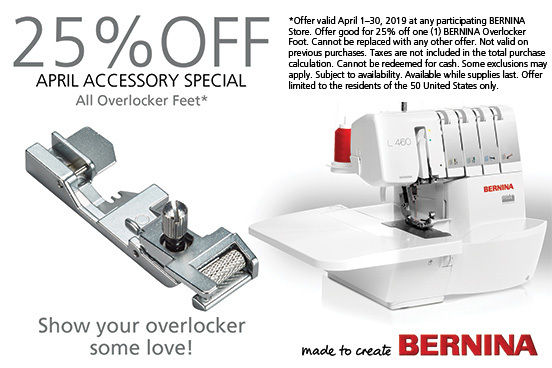 Save 20% off of a new BERNINA machine with a purchase price of $999 and up! You can also enjoy 0% interest for 48 months on machine purchases of $3000.00 or more (pending credit approval). Come on in and try out the machine that you have always wanted! "In the spring, I have counted 136 different kinds of weather inside of 24 hours." "Sweet April showers do spring May flowers."